Have you given up on social? Think it’s just not for your business? Or maybe you haven’t tried out the different social media outlets. The digital social space is more crowded than ever, which is why it is evermore important to stand out from the rest of the posts that your audience is consuming at 1000 miles per minute. We need to “stop the scroll” any way we can. Standing out with creative, well written, and exciting social posts is the formula for success in the organic world of social media. According to Marketing Sherpa, Online adults ages 18-34 are most likely to follow a brand via social networking (95%). The point here is that your customers are following your competitors who are leveraging their social efforts if you are not! In 2015, Facebook influenced 52 percent of consumers online and offline purchases (The Drum). Facebook, the social media giant, continues to be the largest social influencer in the journey of consumers across all industries. Your brand could be missing out on valuable revenue opportunities if it is not making an impression on your target market on Facebook! 1 in 3 Internet users say they go to social networks when looking for more information about a brand or product (Wordstream). Again, your target market is turning to social for information to answer their questions about the products and services you offer. Being a reputable source on social media could be the influence in their decision and WILL win you customers. So… how exactly do you influence your target audience? There are thousands of ways to approach your social media plan of attack. For the purpose of this blog post, we will be focusing on organic social media efforts. Creating social media content is the first step to engage and stay in front of your business’s online audience across the different social media channels. Testing what times of day your page audience responds the most, differentiating post types, and including compelling copy should be the first variables you start to play with. Take ASOS For example. They are a clothing brand, but rarely post about clothing. Yet, they still have a TON of engagement. How is this so? It is because they understand how to create posts that are relevant to the audience and the platform they are posting on. Now, in order to do this, we need to have insights about our audience in order to know who they are. 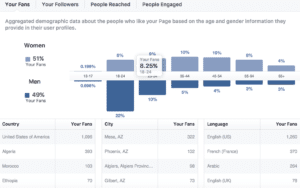 You can do this by using your “audience insights” tab in your Facebook business page. From these analytics, we are able to gain insights about the age of the audience, where they live, what gender they are, when they interact with your posts the most, etc. Even so, you will still need to test what kind of social content resonates the most with your target audience. For example, testing whether an inspirational quote over a link post performs better historically. Typically, photos tend to outperform posts without visuals. Always be looking to include visuals in your social posts! In the beginning when still learning about who your audience is (as you grow you will need to keep learning more about these ever-changing avatars), using different posts-types like asking questions to figure out further what your audience’s interests are. This is a great way to find ways to stay relevant to your audience on the different social channels you own. For example, say you decide to post a survey asking what your audience’s favorite movie is. After you have analyzed the results, you then create a post incorporating your audience’s favorite movie and relate it to your business to engage your audience with their interests AND your brand simultaneously. It’s called social media for a reason. BE SOCIAL. Posting about a new employee, local events your business will be attending, office promotions, or just simply day-to-day office activities will greatly improve your social engagement. It's simple. Take out your smartphone, and start taking pictures from your point of view to show your audience that your brand is HUMAN. Don't worry about high-production here, any content is better than no content when you're starting to grow your social presence. If all of this seems like too much to handle on your own, you can always hire an agency or a social media-marketing manager to focus on every aspect of your social media presence. See our social services. It’s important to stay in front of your customers because while they may not need your service or product now, you will be first in their mind when they DO need what you sell. AND when you do decide to offer something to the audience, you will have given them so much relevant & engaging content in advanced that they will have no problem clicking that link to see what you have to offer them. After you have given your audience a plethora of interesting and valuable content through your posts, you can then throw hard offers to your audience to drive more traffic to segmented pages of your site with high-intent potential buyers/clients. For example, posting a compelling offer of a current special you are running with a link to the product on Facebook is a great way to get people to your site after the relationship has been established. There are hundreds of ways to turn your raving fans into loyal customers. For example, paying the specific channel like Facebook to reach your audience with a specific offer is one of the most viable. Run an ad to your page audience segmenting interests of that specific audience to “hyper-target” audience members that will be MOST interested in your offer. Run a free offer that expresses exclusivity to your page audience, demonstrating that you are rewarding them for being loyal fans. Simply posting an organic link to your site about a new product you have in stock. Turn your page audience across your ideal social channels into a thriving and vibrant community! Social media marketing can work for any company in any industry with the right strategy. Winning customers and keeping a reputation on the different social channels your brand owns has never been more important because of the various revenue opportunities your company has the potential to execute on. Creating relationships with your audience is essential in today’s era when the consumer has more choices for products & services than ever before. Stand out above the noise through social media marketing! For more information about how organic social media marketing can boost your bottom-line check out our digital marketing services. 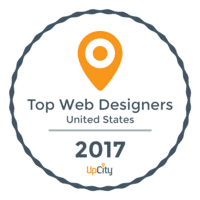 MarketingSherpa, design: Scott McDaniel, code: Steve Beger, MECLABS. Connected Commerce Report.” The Drum, 24 Apr. 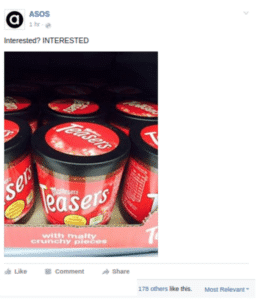 2015, thedrum.com/news/2015/04/24/facebook-influences-over-half-shoppers-says-digitaslbi-s-connected-commerce-report. Amazing article. Social media marketing is the most powerful way for businesses of all sizes to reach prospects and customers. If we are not speaking directly to our audience through social platforms like Facebook, Twitter, Instagram, and Pinterest, we will miss out a lot. Thank you for sharing this fabulous post. Well explained the insight of social media marketing. Social Media really works wonderfully for all size of businesses to build an online reputation, increase social signals, reach and engagement. Thank a lot for sharing such a nice article!